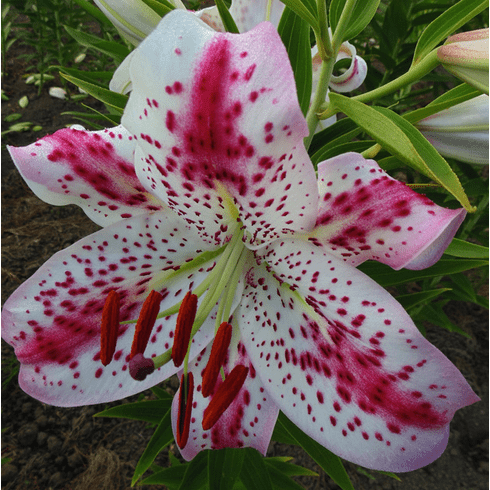 After spending nearly two decades breeding spots out of lilies for the cut flower trade, finally Holland has turned the corner and figured out that Oriental lilies look naked without them. As a result of their seeing the light, we are proud to now offer our customers 'Cherry Splash'. 'Cherry Splash' brings back that old world, English garden look for you to again now enjoy. Not only is 'Cherry Splash' covered in spots that match the splash of cherry color in the outer half of the petals, but also offered for your garden delight is a delicate pastel cherry pink trim on the petal edges. Here in our cooler PNW summer gardens, this flush of color holds up well, but in areas where summer temps hover at 90+ during the month of July, plant in light afternoon shade for greatest effect. Late July Flowering. 3 to 4 Feet. Delightful, mouthwatering fragrance.